Vincent Van Gogh. Van Gogh’s Chair. 1889. Aldous Huxley uses this quote from William Blake as the epigraph to “The Doors of Perception”, a minute-by-minute account of his experiences under a mind-altering drug, mescaline. Huxley took the drug because he hoped it would help him “cleanse the doors of perception”, to open his consciousness to a mystic religious experience. He had anticipated a heightening and expansion of “inner vision”, but instead, mescaline presented him with a heightened and expanded visual experience of the outer, “objective”, world. A small typing table stood in the center of the room; beyond it, from my point of view, was a wicker chair and beyond that a desk. The three pieces formed an intricate pattern of horizontals, uprights and diagonals—a pattern all the more interesting for not being interpreted in terms of spatial relationships. Table, chair and desk came together in a composition that was like something by Braque or Juan Gris, a still life recognizably related to the objective world, but rendered without depth, without any attempt at photographic realism. I was looking at my furniture, not as the utilitarian who has to sit on chairs, to write at desks and tables, and not as the cameraman or scientific recorder, but as the pure aesthete whose concern is only with forms and their relationships within the field of vision or the picture space. 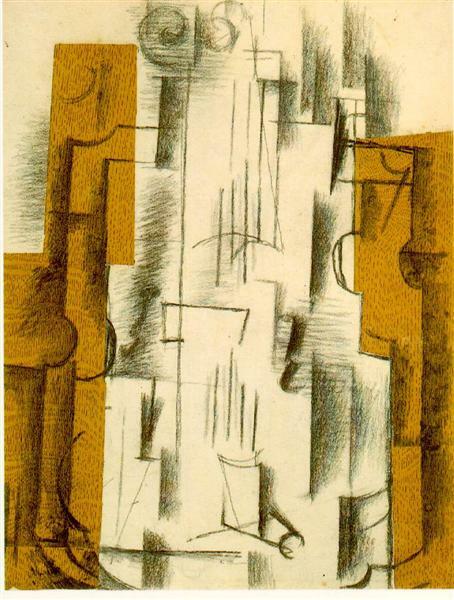 But as I looked, this purely aesthetic, Cubist’s-eye view gave place to what I can only describe as the sacramental vision of reality. I was back where I had been when I was looking at the flowers — back in a world where everything shone with the Inner Light, and was infinite in its significance. The legs, for example, of that chair—how miraculous their tubularity, how supernatural their polished smoothness! I spent several minutes—or was it several centuries?—not merely gazing at those bamboo legs, but actually being them—or rather being myself in them; or, to be still more accurate (for “I” was not involved in the case, nor in a certain sense were “they”) being my Not-self in the Not-self which was the chair. How does this shift happen? The human brain habitually filters the wealth of sensory data it receives, in order to provide its owner with a very coherent and very utilitarian, very simplified and survival-oriented, picture of reality. Normally, the infinite ocean of visual data that reaches the eyes does not register in consciousness: for survival, it’s enough to identify a chair as a chair, and also to have a good idea of where it is (just so you don’t accidentally miss it with your bottom when you try to sit down). Everything else is filtered out by the brain as superfluous and distracting. It is this filtering and conceptualizing machinery of the brain that was suppressed in Huxley by his doze of mescaline. Infinitely richer visual data raised above the threshold of consciousness; or, in more uplifting terms, the doors of perception were (temporarily) cleansed. But there is more: he distinguishes two steps of the process — a “purely aesthetic” vision (and here he points to paintings to give the reader an idea of what he saw), and then, the ultimate mystic vision, the experience of unity, dissolution of dualities. […] I was taken for a little tour of the city, which included a visit, towards sundown, to what is modestly claimed to be the World’s Biggest Drug Store. At the back of the W.B.D.S., among the toys, the greeting cards and the comics, stood a row, surprisingly enough, of art books. I picked up the first volume that came to hand. It was on Van Gogh, and the picture at which the book opened was “The Chair”—that astounding portrait of a Ding an Sich, which the mad painter saw, with a kind of adoring terror, and tried to render on his canvas. But it was a task to which the power even of genius proved wholly inadequate. 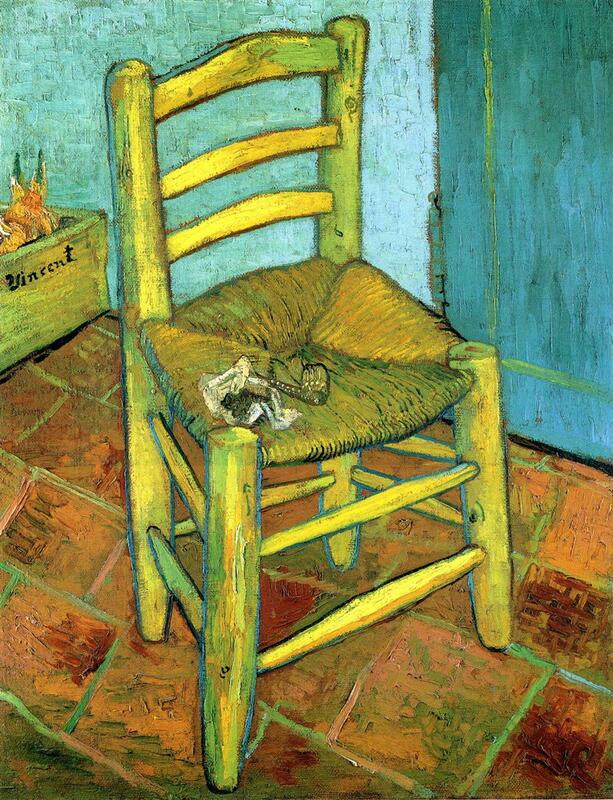 The chair Van Gogh had seen was obviously the same in essence as the chair I had seen. But, though incomparably more real than the chairs of ordinary perception, the chair in his picture remained no more than an unusually expressive symbol of the fact. The fact had been manifested Suchness; this was only an emblem. Such emblems are sources of true knowledge about the Nature of Things, and this true knowledge may serve to prepare the mind which accepts it for immediate insights on its own account. But that is all. However expressive, symbols can never be the things they stand for. Huxley’s disparaging and not a little condescending comments about “the mad artist’s” inability to show what he (obviously) saw may be due, I believe, to the fact that he responded to a reproduction in a (probably cheap) art book, not to the painting itself. A reproduction, indeed, can be no more than an emblem, a pointer to reality (and, in my experience, there is no artist who loses as much in reproduction as does Van Gogh). It would be interesting, in this context, to make a study of the works of art available to the great knowers of Suchness. What sort of pictures did Eckhart look at? What sculptures and paintings played a part in the religious experience of St. John of the Cross, of Hakuin, of Huineng, of William Law? The questions are beyond my power to answer; but I strongly suspect that most of the great knowers of Suchness paid very little attention to art—some refusing to have anything to do with it at all, others being content with what a critical eye would regard as second-rate, or even, tenth-rate, works. (To a person whose transfigured and transfiguring mind can see the All in every this, the first-rateness or tenth-rateness of even a religious painting will be a matter of the most sovereign indifference.) Art, I suppose, is only for beginners, or else for those resolute dead-enders, who have made up their minds to be content with the ersatz of Suchness, with symbols rather than with what they signify, with the elegantly composed recipe in lieu of actual dinner. Is it possible, I wonder, that one can see the infiniteness of reality in a chair (which is, after all, also a result of human artifice), but not in a painting? If one “can see All in every this”, then why would art be excluded? Because Van Gogh’s chair — I just saw it again recently in London — is an indeed overwhelming, astounding, breathtaking fact of (using Huxley’s words) sacramental reality — no less infinite and eternal in its visual richness than any fully seen real chair. More so — because it also makes this reality visible to a viewer who might not have seen it in a chair. This fact, the fact of painting — unlike the fact of chair — cleanses the viewer’s doors of perception without any mind-altering drugs. However we choose to interpret what we see when the doors of perception are cleansed — mystically or psychologically, or anywhere in between, there remains the fact of direct individual experience — or rather, of the dramatic difference between two ways of experiencing visible reality: the utilitarian world of separate things standing out against irrelevant, unseen background, and the infinitely richer, and more unified, world one can see if the filtering machinery of the brain is temporarily switched off. For all we know, the former way of seeing is essential for being functional in the world — both in the world of material things, and in the social world of people. Yet the latter seem to be closer to reality (at least as far as the natural sciences know it so far); it is also much less boring, and filled with joy and awe. And the process of painting from life opens the door to this unified visual reality. There are few people who can show it (like Van Gogh did), but anyone can learn to experience it within the painting process.